Instrumentally (the arrangement and production effectively trounced all comers that summer of '64... even you-know-who! ), lyrically (though one can safely interpret "I'm gettin' bugged drivin' up and down the same old strip, I gotta find a new place where the kids are hip" as B. Wilson's hint at the non-sun, non-hit, B.Boy phase to come), and atmospherically THE hands-down, Number One car tune Of All Time. And, backed as it was on its original seven inches with "Don't Worry Baby," just maybe the greatest single single of all time! 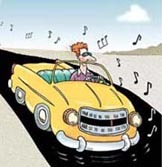 The not-lately great Eric Carmen's definitive Brian Wilson tribute; the logical descendant of "I Get Around" (by way of "Do It Again"), and quite possibly the finest car/radio tune of its decade (ie: it always sounds best when your top's down). Should've been revived by It's My Party on the "Josie and the Pussycats" soundtrack. The Great Chuck could arguably be said to have invented not only the duck-walk and the ding-a-ling (not to mention certain stomach-curdling after-show water-sports), but the Car Tune too (eg: "Maybellene," "You Can't Catch Me," et all!)... yet this little-heard wonder was cruelly denied hit status - even after Lennon & McCartney gamely re-wrote it as "Drive My Car." Another rockin' lil' undiscovered gem that deserves to go Top Ten even more now than it did practically four decades ago. Odd to ponder the author of this masterpiece, against which all other sickle-songs pale greatly, later went on to foist such inanities as "Heroin," "I Wanna Be Black" and "My Red Joy Stick" onto the airwaves. The last - and funniest - word in 1960's hot rod songs: As always, give the self-styled "Laurel and Hardy of the surf crowd" a fad and they'll wickedly yet oh-so-skillfully deflate it quicker than you can say Beavis & Garfunkel. The automobile looms large in the annals of Death Rock ("Teen Angel," "Dead Man's Curve," "Can You Please Crawl Out YOUR Window"...), but J. Frank's morbidly moody number contains all the necessary ingredients (a railroad crossing, a stalled car, an on-coming train, and your fiancée) - and then some! (ie: cheesy "Runaway" organ, sounding appropriately ominous herein). Sounds Good Even On CD, such is the magnitude of this timeless tone poem. Lack of one's own wheels at the turn of that decade did little to dissuade the restless masses from spending their summers alongside the nation's thoroughfares, thumbs erect, trouble afoot. As a result, a spate of hitch-hikin' ditties suddenly materialized, of which this remains my personal fave. Sure fit perfectly amongst "Yellow River," "Going Up The Country" and, yes, "Sweet Hitch-Hiker" back in Grade Ten, I'll tell ya fer shure. I know, I know: it's hard to believe these bozos made a decent record after they last raided the Neil Diamond songbook, but this here "molten slab of heavy-duty ROCK," as FM DJ's still refer to it, picks up nicely where "Born To Be Wild" left off, helping motorvate Car Tunes confidently into the dreaded Seventies.